Last year we told you about an 8-bit demake of Mega Man Legends 3 being produced by a group of fans; it promised quite a departure from the original 3D adventure, naturally, as it was taking the characters and setting for a more typical 2D action Mega Man experience. It's taken quite some time, but it's finally finished and available to download for free on PC. To access it you need to visit this page and type "dash3" in the dialogue box. There are some features to help distinguish this one from the other 8-bit fan-made Mega Man games out there, such as a roll move, an option to use a limited meter for an instant charge shot and a jumping kick attack. Get Me Off the Moon was a group that included contributors from around the globe, so it's interesting to now see the result of these endeavours. We'll take a look and you can see a trailer below — will you be giving this a try? If they make an English version, then yes. I'm going to play it tonight. I can get past the language since it does not affect game play. 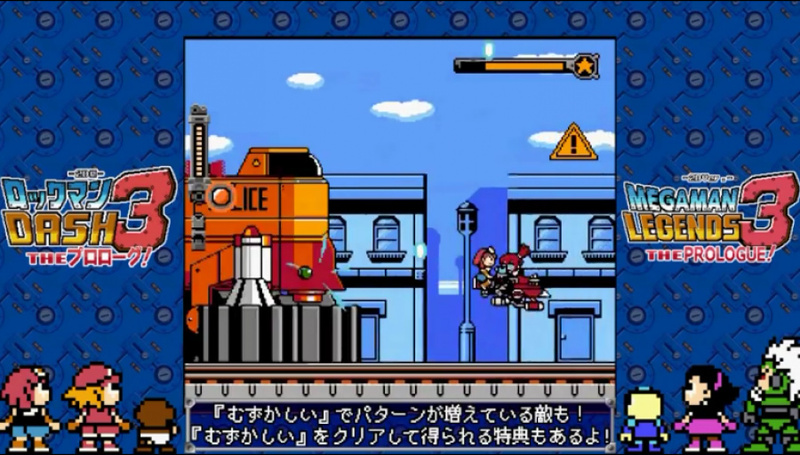 I actually thought the game had English as well....I think Protodude's Rockman corner had mentioned someone helped in translation, but maybe that was for the article. In before Capcom slaps it's name on this and expects you to give them money for it. @hypercoyote What are you talking about? Once your download the game, it has both English and Japanese version. This game is freaking tough. I love it and NIntendo should make more games like this. @GreatPlayer I was talking about the comments above mine that were saying they wanted it released in English. But your comment confirms what I was suggesting. @hypercoyote Sorry, I thought you meant you thought the game had English, but you checked and it did not. @GreatPlayer Yea, I have downloaded it but hadn't played it yet, so I wasn't sure. Looks pretty fun, I'll be sure to try it out once I get a new charger for my laptop. @hypercoyote @GreatPlayer Wait, so the game is in English? Oh yeah, I'm going to play it, and don't get me wrong when I say this... But I still find it sad that fans has to make something they been waiting for, and didn't get from the officials. So I hope this is a big middle finger to Capcom and that this tells them that we would've loved Legends 3. On the other hand, I wish they didn't take the 8-bit route... It's as tiresome as Sonic the Hedgehog 1 hack games I see all the time. 16-bit & plus wouldn't hurt. @RantingThespian According to @GreatPlayer, it has both English and Japanese, which jives with what I had read before. @hypercoyote Thanks for clearing that up. I'll be downloading this today then. Capcom is far too busy creating new collectibles to mine the nostalgia base for more money to even THINK about having the time to create a new game. They haven't even been able to throw their efforts into an updated anthology collection to include 9 and 10. Can't download it. The password isn't working. A lot of people must be trying to download it, because I was having the same issue. After a few tries, it worked for me. @hypercoyote Yes there is an English version in the folder playing it right now. love that 8bit flutter theme! @YuuMonMu Sadly, Capcom is the king of the blind these days. They wont see anything as a "middle finger". Theyve seen the fan ruckus MegaMan Unlimited caused and...did nothing. They saw how much attention the blue bomber got since his Smash debut and...still nothing. Not even a counter measure to Mighty Nr.9, nothing. They are blind, deaf and lack common sense. A well made MegaMan sequel would print money at this point, especially a Nintendo bound one to ride the Smash hype train. But were talking about Capcom here afterall. That'll in an odd way show Capcom. Bait people that heavily, screw them over, and someone somewhere will take things into their own hands. Count on this being translation patched, just like Cave Story Windows was years ago. If it's good enough and the demand (no question) is there, stuff happens. How to enlarge the window for playing this game? It looks too small on my screen.